Today was the 10th annual NICU reunion. It is a time for all of our graduates to get together so we can see how they've grown and changed. I love seeing all the parents again and how the babies have grown into toddlers. Many of the nurses who have been working longer than I get to see kids in college or who are even married which will be so wonderful. Many of the families I still try to keep in touch with, but there are always some surprise faces I've forgotten. I tried to take some pictures, but this is clearly not everyone who I got to see! Enjoy!! Tonight we had an official date, it has been way too long! We went out to dinner downtown at McCormick and Schmicks; it was amazingly good! Then we walked to Lucas Oil Stadium and watched the HSE/Avon football game. We didn't recognize anyone we knew and the students looked SOOO young it was crazy! We walked around the stadium, it was huge and very nice! We thought this might be one of our few chances in the near future to see it! Then we walked back to Monument Circle and then were on our way home. My hands and feet were very swollen from all the extra walking, but it was worth it! We went to dinner with Matt and Janelle then went cosmic bowling. It was a really fun time!! Janelle had her lowest score ever her first round, then beat Matt in the second round....so we won't discuss Matt's score! Tessa had fun too, she was moving around and around! Katie invited everyone to swim at her parent's house today. All of us work together and have formed a great friendship that goes beyond work. Fortunately a few of them have ventured into the parenting world before me and have been a great resource for advice! Thanks girls!!! Baby Ty (Amy's son) was napping during picture time. 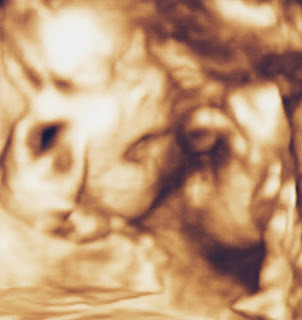 Today was our 28 weeks doctor's visit. Tessa checked out just fine as usual. Her heart rate was 140-150's and she measured right on track. The next thing on our to do list is choose a pediatrician for her, so if you have any suggestions of a Fishers pediatrician let us know. I had my sugar test, so I drank my glucola and had some blood drawn. I guess that they will just call me if they find something with my blood work. I have gained weight and officially broken the pre-pregnancy weight! Yea!! 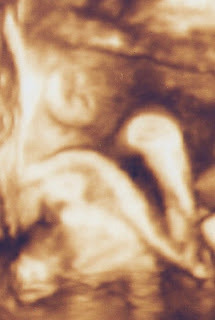 We will go back in 3 weeks and then the appointments will just gradually get closer and closer together until she arrives! I wanted to post a few pictures of Tessa's room! I still have a few things I would like to do in there but this give a pretty good idea of how the finished room will look! The butterflies are 3D in lots of different prints. They are above the changing table, and then randomly on other walls. 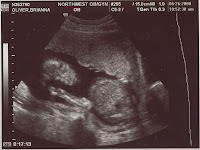 Here are the pictures from our 4D ultrasound...Thank you Courtney!! 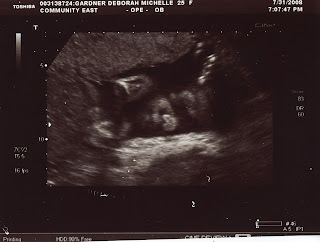 Tessa was VERY active throughout the whole ultrasound so we had to snap her picture when we could. She kept putting her right arm up over her head and face. We were able to get some really good ones....so, here they are! Look at that nose and those full lips! Her mouth is in the center wide open and her thumb is going toward it. She was putting her fingers and fist into her mouth the whole time. This is her ear, shoulder, and arm. 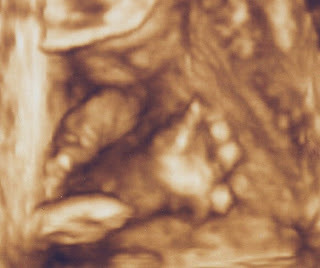 This is a close up of her little hand; 5 fingers! 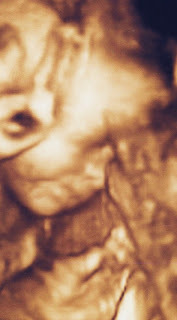 This is my favorite one; her chubby cheek, dainty chin, and little nose. I can't wait to see if she looks like the picture. 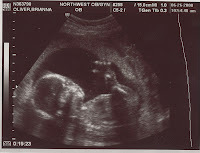 I also was able to make some copies of her past ultrasounds and thought I would post those for you to see too! 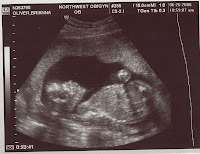 The last 5 pictures were taken at 20 weeks when we first found out it was a girl! Tonight was the first class of childbirth prep. We learned some breathing techniques which I find hard to believe would actually work! :) I learned a few exercises to start stretching my muscles and to help with lower back pain. The best part was when Dan learned some massage techniques to help with lower back pain and was told by the instructor to do them EVERY night. So...I think I will like this class. It will last 5 weeks and ends the 2nd week of Sept. At that point we will be 30/31 weeks!! I can't believe how the time is flying! We'll keep you updated on the progress! 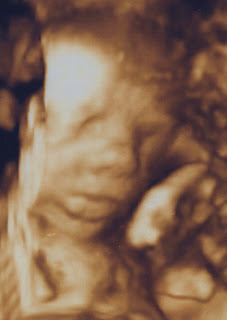 Courtney is going to do another 4D ultrasound this week, lets hope Tessa will cooperate and we can get some face pics. I will try to post them on here if I can figure it out! Most of our close family has been calling the baby Tessa now for a couple of weeks so I thought it would be o.k. 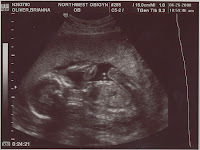 to go ahead and make it official and announce our daughter's name! After much discussion and debate between Dan and I after finding out we were having a girl we both agreed on Tessa. 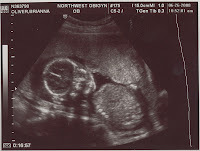 We think it is a sweet name for a little girl but also a name that will grow up with her into adulthood. Her middle name is Rose in memory of Dan's Grandma Rose. We drove down to Grams' house today to have brunch and visit for a while. It was really nice to see her and we had such beautiful weather! She gave me some of her china and cut glass dishes that I will always treasure forever. We thought we'd take a picture by the good old Indiana corn fields!